"Get out of #Jail Free Card" by Mark White is a $9.99 eBook that promises to reduce your workweek from 70 to 40 hours. Mark White has spent two years testing the methods in his new book, and now he’s made it available to workaholics worldwide. This short book is designed as a tool rather than as an armchair diversion. It shows you the faster, easier, natural way to take back your life. I am not the type of person who uses the phone a lot. I’ve learned very early to transfer complete business related communication to email. Written trace of a correspondence is much more practical, because you can keep track of who said what and when. Tools like Basecamp just brought it up to a higher level. Basecamp and Highrise lead off "7 Indispensable Web Tools Every Ecommerce Merchant Should Be Using"
eCommerce Hacks lists 7 Indispensable Web Tools Every Ecommerce Merchant Should Be Using. Basecamp and Highrise lead it off. The product of 37signals, BaseCamp is a wonderful project management tool that’s fully web-based, so you never have to install any programs onto your computer. In basic terms, what Basecamp will do for you is to keep track of what you need to do, when you need to do it and assign tasks to anyone who is involved in the project. Because everything is hosted on servers, you can access Basecamp from where ever you have an Internet connection. Once you figure out how Basecamp works, it becomes an indispensable tool in your everyday work-flow. With Basecamp, collaborating with others is made easy and keeping track of important events is automated with their notification system which emails or texts you of upcoming events. Highrise is also a product of 37signals and is a easy to use contact management web tool. OK, so what’s contact management? Simply put, it’s a Rolodex that you can access on the Internet. What makes this better than a Rolodex is that anyone who has the right credentials can access the information through the Internet and catch up on the latest information about contacts. For example, if you contacted one of your key customers, you can enter their information along with a summary of your conversation and set reminders or next actions based on the last conversation. When it’s time for the next follow-up, anyone in charge of the customer can read the last summary to get a good idea of what was discussed prior to contacting them. PC Magazine: "Basecamp is the simplest, fastest, and most scalable project management service available"
Basecamp is the Editors' Choice winner of PC Mag's "The Best Free Online Project Management Software." With over 3 million active users, Basecamp is the benchmark of free online project management developed by 37 signals. It helps small businesses and large businesses, from wedding planners to hedge fund managers, to get and stay organized. While other online services heap on the features—and complexity—Basecamp remains, after nearly seven years of service, the simplest, fastest, and most scalable service available. OmniFocus is a native project manager for Mac, iPhone, and iPad that you can bridge to Basecamp with a product called Spootnik. Macworld recently explored the connection. Spootnik can sync Basecamp with just, say, an iPhone or iPad (no Mac version is needed as an intermediary), or with every type of Apple-made device you can throw at it. It also provides a separate Web interface for editing your OmniFocus tasks in a browser. 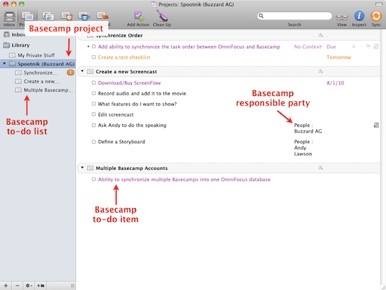 You can customize which Basecamp projects and task lists you synchronize, as well as how often Spootnik should sync. Basecamp projects become folders in OmniFocus, and Basecamp task lists become to-do lists under each OmniFocus project folder. If you assign tasks to team members in Basecamp, their names become contexts in OmniFocus for yet more organizational power.